The Dodgers came into the last series against the San Francisco Giants, who are undoubtedly their biggest rivals, with high hopes after a mixed set of performances in Spring Training – including one win and one loss against the Giants – who were put to bed following an offensive masterclass against the Arizona Diamondbacks over the opening weekend; at the same time their opponents were falling to a narrow defeat against the San Diego Padres. Those factors combined with the thrashing the Dodgers dished out last time they faced off against the Giants, had most people expecting a comfortable ride for the LA side. The first game of the series raised several eyebrows as the Giants emerged victorious with a 4-2 win despite falling behind. Things were going according to plan for the Dodgers – even if they were not as high scoring as they might have liked, Chris Taylor and Alex Verdugo hit homers to put them in a strong position. They also backed up some excellent pitching from 22-year-old Julio Urias, who was making his first start in approaching, two years following injury and subsequent shoulder surgery on his throwing arm. Whilst Dodgers coach Dave Roberts was raving about “fun to watch” Urias’ “fantastic” return to the mound, their preseason signing Joe Kelly, who arrived on a $25 million three year deal from the Boston Red Sox, was left ruing a “really, really horse crap” display. Nonetheless, he was quick to downplay the booing aimed in his direction stating he’s faced worse and insisting “results will come” – as his opening pitch was smashed for a home run by Brandon Belt, in what proved to be a pivotal moment in the match, as the Giants went on to win. 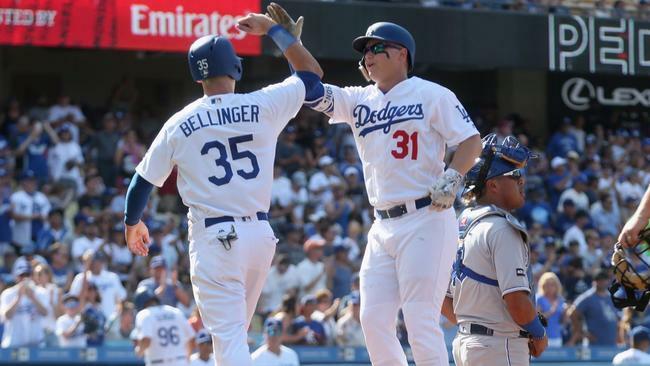 The following night’s match was another close encounter but went in a different direction as the Dodgers survived a wobble to hold out for a narrow victory, which was aided by, the awesome again, Cody Bellinger as he hit a grand slam – the fourth of his career. His performance helped to off the pitch Madison Bumgarner, who was having a tough session at the mound. The grand slam, that also involved Enrique Hernandez, starting pitcher Hyun-Jin Ryu and A J Pollock, gave the Dodgers a 5-0 lead. Bumgarner looked to make amends with bat in hand as he pulled the scoring back to 5-2 but it wasn’t to be, and the series was well and truly in the balance heading into the third and final game. Until the Dodgers sticks did the deed again in the rubber game, as veteran David Freese’s two-run double got the Dodgers out of a 3-2 jam. 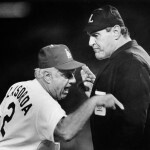 Eventually the Dodgers won 5-3, taking the series from the Giants and notching another long ball for the record books. Enrique Hernandez smashed a lead-off home run off of opposing starter Derek Holland. The boys in blue only hit one dong in that game but tallied four doubles. The Dodgers are rightly favored for the first phase of their upcoming road trip and their offensive game has been incredible both in the early part of this season and the latter of the previous campaign. They’ve started this season hitting a minimum of one home run in each of their first eight games – a joint franchise record meaning the next divisional match presents an opportunity to set an outright one – taking their consecutive run of games with homers back to September 2018 and 10 matches. Los Angeles heads into this match sitting top of the National League West knowing that the opening match ups have only been close due to their own mistakes rather than outstanding quality from their Arizona or San Fran based enemy. It’s widely anticipated that center fielder Kevin Pillar, who moved from the Toronto Blue Jays, will make his home debut for his new team and Giants fans will be hoping he can drag their batting average up. Still, most eyes will be on the Dodgers to see if they can set that new record and maintain top spot. If they produce baseball at anything near their best, then it’s fair to say it will likely take more than Pillar or any other division rival to make the difference. Huge difference this year (so far so good) in scoring runs with the sacrifice fly. Multiple runs today again via the sac fly. I don’t remember so many in the past few years and this year it’s been a very pleasant surprise. That’s part of Dodgers baseball, at least for me. Keep it going!! Floro and Garcia looked better. I like the concept of Alexander still. PS: Scott’s first sentence in today’s post is a doozy. Bullpen still looks a little shaky. Stewart will be gone soon……….like as soon as Kersh is activated. The guy is a deer in the headlights. Riding the pine while lefty’s pitched cooled Pederson off. Seager showing some rust but also some good things. For some reason the Rockies bats are very chilly. Muncy making me eat a little crow, and that’s ok. The Dodgers have signed 17-year-old catcher Nelson Quiroz. In addition the Dodgers have also agreed to terms with 17-year-old right-handed pitcher Hendrick Briones. Both are from Mexico. The last time the Padres were three games over .500 was on April 23, 2015. It has been a very good exercise In rebuilding that team after the initial disaster of trading for Kemp, etc. The move for Machado makes some sense, in terms of being a veteran cornerstone as they infuse all of their young talent. They will be our rival and main competition for the division, IMO, for years to come. Maybe even as soon as this year, although I think probably 2021 is a bit more realistic. Back in 2014, BA had them ranked as the No. 6 best system. But those guys didn’t pan out as they hoped. So they tried something else but that didn’t work. So they tried another tact. They kept trying different things! And here they are, hoping a blend of a few really good veterans and youngsters can turn the tide. Offensive surge continues. What is nice about the Dodgers this season is they are not just hitting HR’s, they are getting productive hitting this year. Verdugo is like a Dog on a leash, just waiting to be let loose. I like his confidence, no deer in headlights. Well, feel bad for Pederson. His lengthy time “benched” due to platooning has definitely taken its’ toll. He cannot even hit rightys anymore. Why did the Dodgers sit him so long? There must be more to it them we know. His defense is there, and he does not appear to be injured. Is it a discipline thing? Buelher had a good outing yesterday, and it looks like Muncy has found his mojo. Jansen faired well in the thin air with his 4 out save. I thought Colorado would be the only NL West team to challenge the Dodgers, but look out for the Padres. The West may not be the cakewalk for the Dodgers that everyone seems to think. Good day Bluefan4Life. Were you or anyone here surprised at what Roberts and Co. did with Joc? I for one am not surprised at all and the platooning analytics take hold once again. Most of us KNEW BEYOND A SHADOW OF A DOUBT that Pederson would sit in those 4 games Dodgers saw LHP.. and when he was put back in there on Saturday, his offense or lack of does not surprise me one bit. But then again Joc KNOWS that shortcoming of his against LHP. But he will never improve because he will never get much chances to start any game when a LHP is going. I honestly don’t know or am not aware of any other MLB manager that does a better job than Roberts in cooling off the hot bats… amazing to say the least!!!!! !